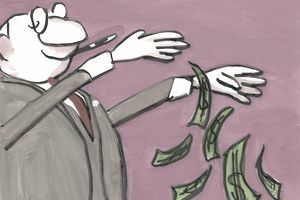 A nation monetizes its debt when it converts debt to credit or cash, freeing up capital that's locked in the debt and putting it into circulation. The only way a country can do this is with its central bank, which purchases the government debt and replaces it with credit. In turn, the central bank puts the debt on its balance sheet. The Federal Reserve, also known as the Fed, is the central bank of the United States, and it monetizes U.S. debt when it buys U.S. Treasury bills, bonds, and notes. When the Federal Reserve purchases these Treasurys, it doesn't have to print money to do so. It issues credit to the Federal Reserve member banks that hold the Treasurys and then it puts them on its own balance sheet. It does this through an office at the Federal Reserve Bank of New York. Everyone treats the credit just like money, even though the Fed doesn't print actual cash. This process is called open market operations, and the Fed also uses it to raise and lower interest rates when it buys Treasurys from its member banks. The Fed issues credit to the banks, which often results in them having more reserves than they need to meet the Fed's reserve requirement. Banks will lend these excess reserves, known as Fed funds, to other banks so that they can meet their reserve requirements. The banks usually offer a lower interest rate, known as the fed funds rate, to other banks so they can unload their excess reserves more easily. How does this process monetize the debt? When the U.S. government auctions Treasurys, it's borrowing from all Treasury buyers. These include individuals, corporations, and foreign governments. The Fed turns this debt into money by removing those Treasurys from circulation. Decreasing the supply of Treasurys makes the remaining bonds more valuable. These higher-value Treasurys don't have to pay as much in interest to get buyers. This lower yield drives down interest rates on the U.S. debt. Lower interest rates mean the government doesn't have to spend as much to pay off its loans, and that's money it can use for other programs. This process may make it seem as if the Treasurys bought by the Fed don't exist, but they do exist on the Fed's balance sheet. Technically, the Treasury must pay the Fed back one day. Until then, the Fed has given the federal government more money to spend. That increases the money supply, thus monetizing the debt. Most people didn't worry about the Fed monetizing debt until the 2008 recession. That's because until then, open market operations weren't large purchases. Between November 2010 and June 2011, the Fed bought $600 billion of longer-term Treasurys. That was the first phase of the expansion of the operations of the central bank, or quantitative easing, known as QE1. There were four phases of the QE program that lasted until October 2014. The Fed ended up with $4.5 trillion in Treasurys and mortgage-backed securities on its balance sheet. On June 14, 2017, the Fed said it would reduce its holdings so gradually it wouldn't need to sell them. The process began in October 2017. As of January 2019, the Fed was still doing that by allowing $50 billion in proceeds, mostly from its portfolio of bonds, to run off its balance sheet each month. Some people believe that this program is damaging because it could cause long-term interest rates to rise further. That’s because there will be a greater supply of Treasurys on the market, and the U.S. Treasury will have to offer higher interest rates on the Treasurys it auctions to convince anyone to buy them. That will make the U.S. debt more expensive for the government to pay back. People also believe that this program is removing liquidity from the market and could indirectly impact stocks around the world. However, Federal Reserve Chairman Jerome Powell said in January 2019 that the Fed would adjust the balance sheet program if it was causing big problems in financial markets. The Fed's primary purpose throughout QE was to lower interest rates and spur economic growth. Banks base all short-term interest rates on the Fed funds rate. A low prime rate helps companies expand and create jobs. Low mortgage rates help people afford more expensive homes. The Fed wanted QE to revive the housing market. Low interest rates also reduce returns on bonds. That turns investors toward stocks and other higher-yielding investments. For all these reasons, low interest rates help boost economic growth.